Annual lantern show dazzles in Taipei?Video? The Taipei Lantern Show opened at the Sun Yat-sen Memorial Hall on Thursday night to celebrate the Lantern Festival. All kinds of lanterns showcased at the annual event, attracting tens and thousands of tourists and of course, local residents. 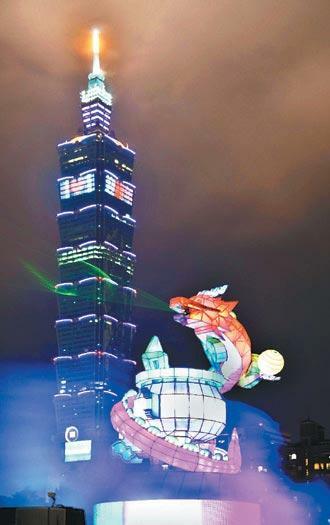 The 21-meter high dragon-shaped lantern was lit at 7:30 Thursday night amid cheers and applause from the crowd with the iconic Taipei 101 skyscraper in the background. An eye-catching light and music show, accompanied by 3D-animation, digital water curtain displays, and colored lasers lasted throughout the evening. A Taipei resident said, "It's the best lantern show in recent years. This year's event included many lanterns we have never seen before. It was really a great one! " with the iconic Taipei 101 skyscraper in the background. A Taipei resident said, "It's wonderful. Maybe the dragon-shaped lantern is the best in Taiwan." Besides traditional lanterns and LED lanterns, the lantern show also featured an environmentally-friendly section of lanterns made with recycled materials designed by students. What's more, an inverted pyramid-shaped structure projected 3D images of circling dragons was also on display in front of the Taipei City Hall Plaza. The lantern show runs through Feb. 12.